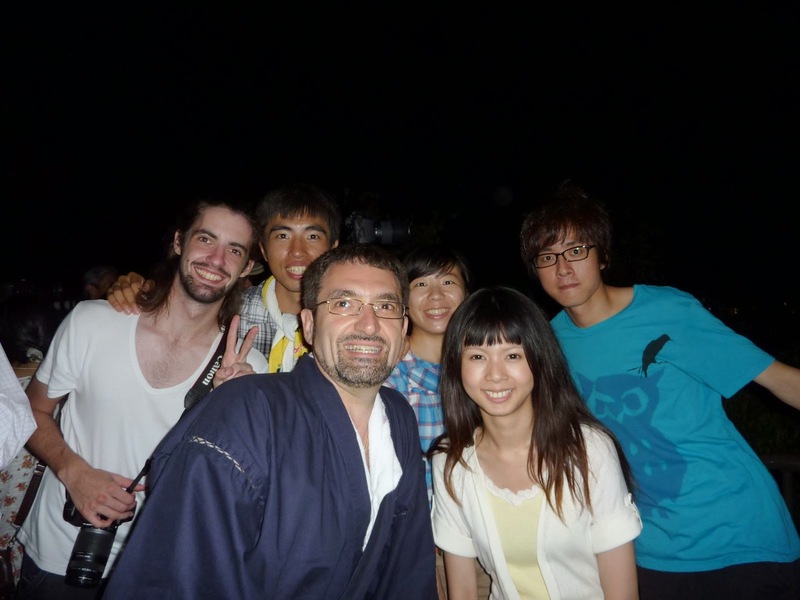 The Japanese hold ceremonies at the end of Obon, the period in late summer during which the spirits of their ancestors are believed to visit this world, to ensure the safe return of these spirits to the spirit world. 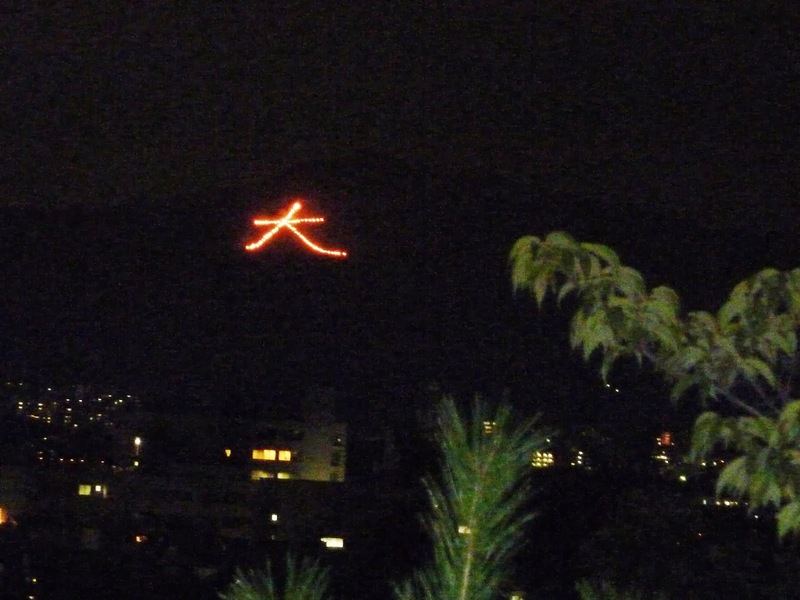 Gozan-no-okuribi, annually held on August 16th in Kyoto, is one such ceremony that--as the name indicates--sends off the spirits with large bonfires in traditional shapes on five mountains: those shapes are dai (the kanji for 'large'), myo and ho (kanji meaning 'wondrous dharma'), a boat, a torii shrine gate, and hidari-dai (left 'large'). The origins of this event--commonly known as Daimonji after the dai bonfire--are obscure, but it is widely thought to have begun between the 14th and 16th centuries. 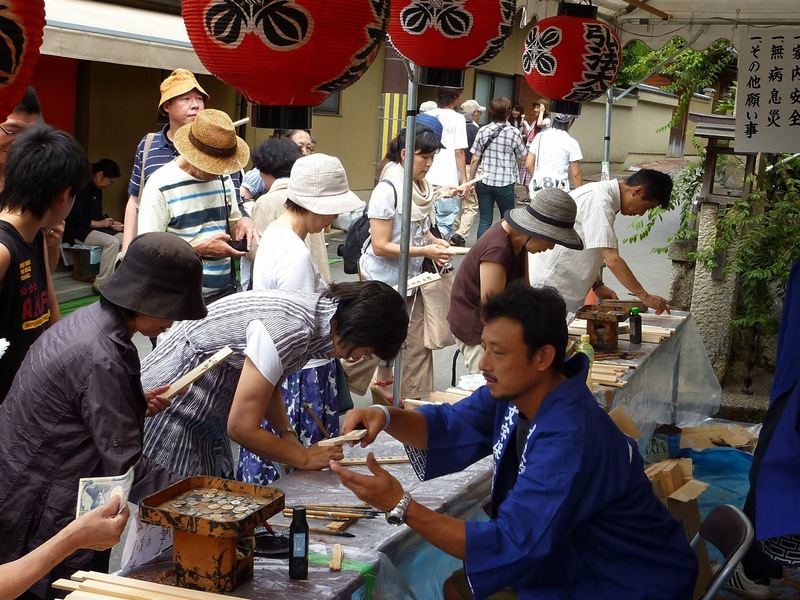 Wooden gomagi slats, which are burned in the bonfires, are sold from the 15th until 2 p.m. on the day of the event at the entrances of Kinkakuji, Ginkakuji and other temples. Once people write their ancestors' names, prayers or wishes on them, the gomagi are carried up the mountains to be laid on the bonfires. I wanted to actively participate in the festival, so I visited Ginkakuji and bought two gomagi slats that were destined for the daimonji bonfire on Mt Nyoigatake behind the temple. Ginkakuji, which is charming and captivating, is one of my favourite temples. After a stroll through the gardens, I turned to the mission at hand--searching for a prime viewing spot. Many hotels and other establishments guarantee you a view of the bonfires for a price. However, I like enjoying festivals among the crowds, and finding a location from where to view the bonfires is, apparently, a challenge. Kamo-ohashi bridge over the junction of Takanogawa and Kamogawa rivers offers the perfect view of daimonji. I crossed the stepping stones on the river, in which people off all ages were playing, to the spit. Considering the view, I was not surprised to see the choice picnic spots already staked out with blue plastic sheets. The gentleman at Yoshidayama was right. I continued along the west bank of Kamogawa with my map open hoping to find the spot that the locals would want to keep a secret. 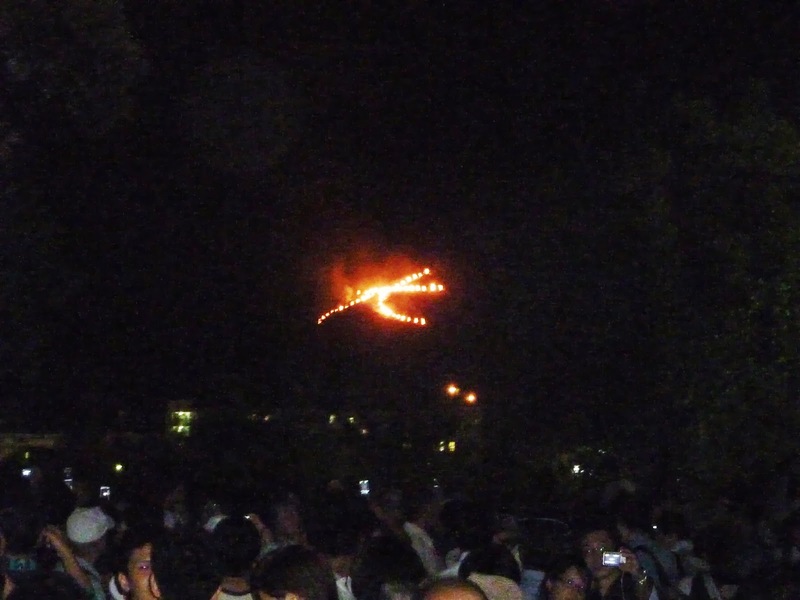 Even though daimonji was clearly visible, trees and buildings obstructed the other bonfires, especially, at river level. I was still hopeful, though, that I would find a good location to view as many of the bonfires, as possible. I noticed less people between Aoibashi and Izumojibashi bridges and felt nervous. I asked an elderly couple preparing for the arrival of their friends and neighbours for advice on the best vantage point. Myo-ho would not be visible due to the buildings obstructing the view from here, and only the stern of the ship would be visible from Izumojibashi. The wife explained how, centuries ago, each household lit their own bonfire, but the authorities decided to burn the bonfires collectively in mountain clearings due to the fire hazard. As I took my leave, I asked about the absence of the ubiquitous food stalls found at all festivals in Japan and was disappointed to hear that a city ordinance enacted in recent years banned the stalls during Gozan-no-okuribi. I continued along the river further north to Kitaojibashi, but still no luck. As the couple suggested, the bonfires are best viewed from a higher location. Here, I took a bus to Funaokayama, which is directly west of Kitaojibashi along Kitaoji-dori, resolute that I would stay there no matter what the view. 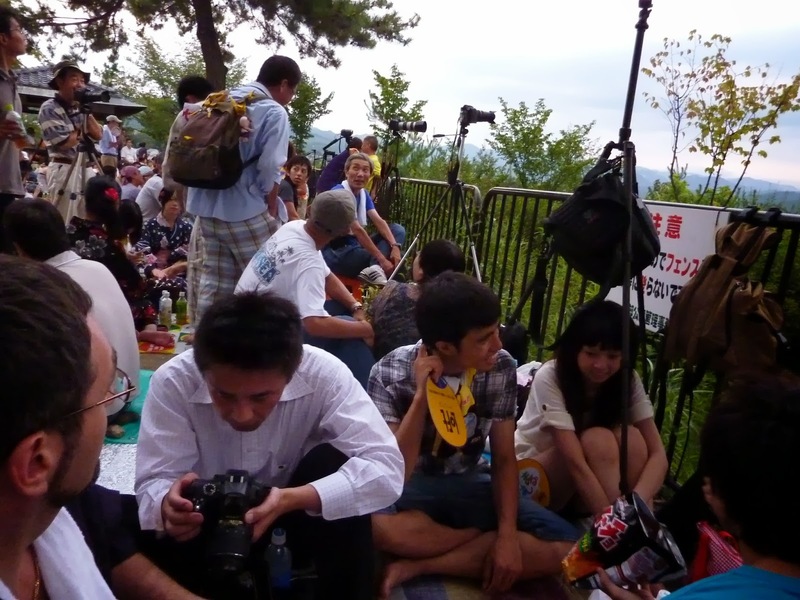 The climb was steeper than Yoshidayama--promising. At the lookout, I was greeted by the sight of many unattended plastic sheets staking claims. With map in hand, I wandered among the plastic sheets, lining up the mountains, and found a small spot from which I had a clear view of daimonji, myo and hidari-daimonji, and a partial view of ho and the boat. Mission accomplished with two hours to spare. I spread a newspaper, anchored it with rocks and visited the local convenience shop. To pass the time, I talked with the people around me, and I found that most--like myself--were not locals. Some were from cities as far as Tokyo, and others from Taiwan and Sweden. Apparently, the locals choose to stay home to watch the event on TV. 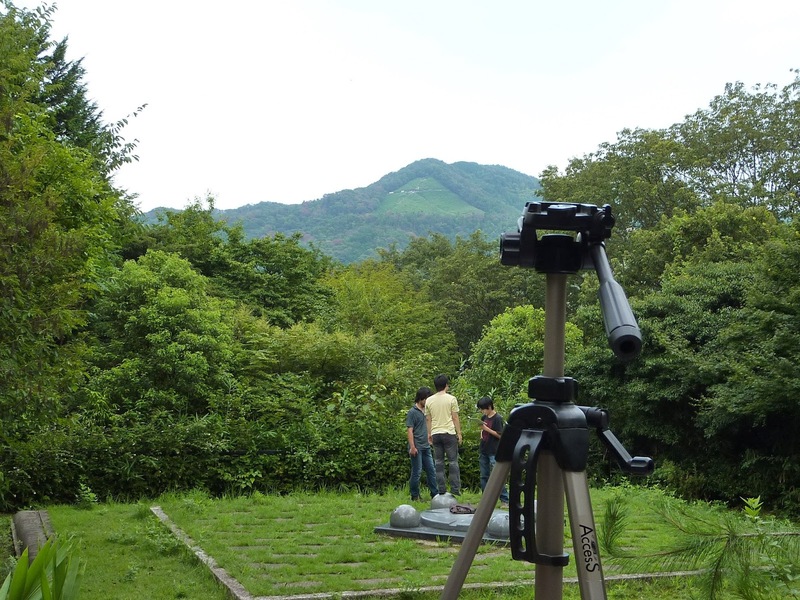 The practice run at hidari-daimonji caused a minor stir. People took photos and adjusted their camera settings ready for the main event. Everyone stood in anticipation minutes before the lighting of daimonji, the first bonfire. The lookout was becoming so crowded that it felt like being on a peak-hour train. When daimonji was lit at eight o'clock, the lookout roared with excitement, drowning out the cicadas. I turned to find a sea of arms stretching to the stars with cameras in hand taking the shots of the bonfire. Ten minutes later, myo and ho were lit. Everyone shuffled to face them, raising their mobiles and cameras into the air, again. 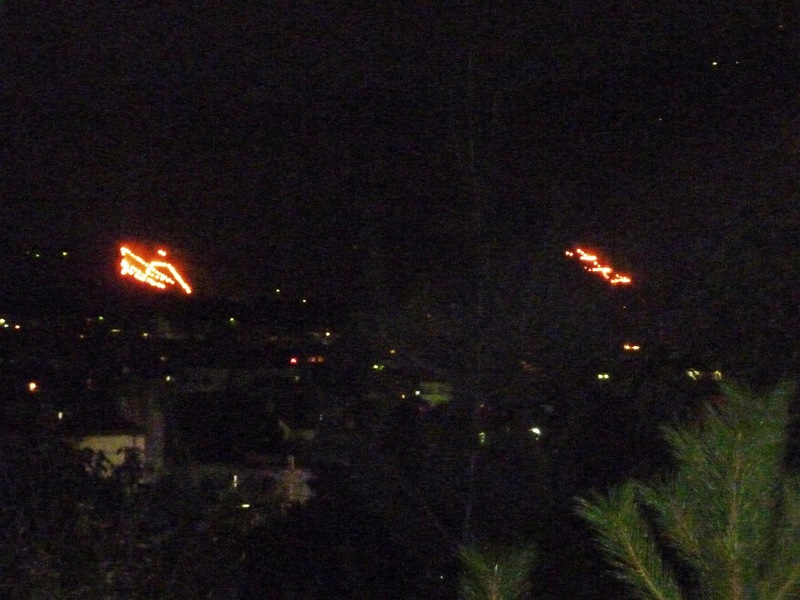 Despite the shapes of the bonfires being distorted from here, they were spectacular, nonetheless. My disappointment at only the top of the boat sail being visible was soon forgotten at the sight of hidari-daimonji burning directly behind us. Taking good shots was difficult considering the distance, but I was still impressed with my photos. Caught up in the excitement, I had forgotten that my gomagi were blazing in the distance. I paused from my photo-taking frenzy and turned to watch daimonji burn. I wondered where exactly they were placed. I closed my eyes and hoped that my prayers would be heard as the smoke carried them up into the heavens. [September 15, 2014] I have just finished working on an episode of Core Kyoto on this ceremony to air September 18 and 19 on NHK World.